NORWEGIAN AIRLINES HAS announced that passengers who are due to travel from Cork and Shannon airports to the US early next month will now fly out from Dublin. The airline confirmed this afternoon its Cork and Shannon passengers travelling in early April to Providence, Rhode Island and Stewart, New York will be transferred by bus to Dublin airport to catch their flight. 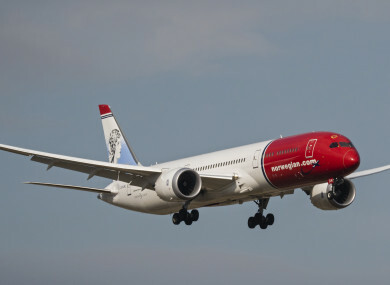 Earlier this month, Norwegian announced that it would temporarily operate a Boeing 787-9 Dreamliner to operate daily from Dublin Airport to New York Stewart airport after the 737 MAX fleet was suspended from European airspace. The flight combines its Dublin to New York and Providence flights, which it says was done to keep cancellations to a minimum. In a statement today, the airline said from 31 March onwards it will be operating additional services from Dublin Airport using a Boeing 737-800. The 737-800 will operate its new Dublin to Toronto’s Hamilton route, four times a week. The aircraft will also be used on flights between Dublin and Providence on Tuesday, Thursday and Saturday. However, the airline will not be operating from Cork or Shannon airport for a period next month which means passengers already booked during that period will be transferred by bus to Dublin airport. From 1 to 10 April, people due to fly out of Shannon to New York and Rhode Island have been transferred to flight D8 1763 on Norwegian’s Dublin to New York (Stewart) service using the Boeing 787-9 Dreamliner. Similarly, anyone flying from New York and Providence to Shannon during the same period will fly into Dublin airport. Norwegian has said it will provide bus transportation for customers to get from Shannon to Dublin. Norwegian has arranged bus transportation, departing at 9.30am, for customers at Shannon Airport to arrive at Dublin Airport Terminal 2 at 12.30pm to meet their flight. Customers travelling on 31 March can also benefit from the bus service. Buses will also meet arriving passengers at Dublin Airport’s coach park at 8.30am for those travelling to Shannon. Passengers booked to fly from Cork to Providence on flight D8 1821 – between 2 and 9 April – have been transferred to flight D8 1823 from Dublin to Providence serviced by a Boeing 737-800. Likewise, passengers due to fly from Providence to Cork during that same period, have been re-accommodated on flight D8 1822 from Providence to Dublin on the Boeing 737-800. Norwegian has also arranged for bus transfers between Dublin and Cork airport. The carrier is one of many airlines affected by the global grounding of the Boeing 737 MAX fleet following the Ethiopian Airlines crash that killed 157 people. The crash led to the grounding of around 350 Boeing 737 Max jets worldwide, when it was suspected there was a problem with the plane because of the similarities between last week’s accident and October’s Lion Air tragedy. Norwegian said in a statement that it is currently “working on more permanent measures to operate normal services from 11 April that will minimise inconvenience for customers and will provide updates to customers in due course”. Email “Cork and Shannon passengers to be bussed to Dublin to catch Norwegian's US flights ”. Feedback on “Cork and Shannon passengers to be bussed to Dublin to catch Norwegian's US flights ”.